I have been trying to control my weight as long as I remember. Every time I would lose a few kilos, I would end up gaining them back in no time. I tried every aspect possible and never got to what I desired. I have been training with Ross for the past 7 months now and not only have I lost a lot of weight, but he has made me love working out and taking it to another level. 7 months ago, I would have never imagined myself waiting for each session and pushing myself to work out even when I am on my own. I had multiple trainers in the past, but none of them has ever challenged me the way Ross does. I was never the type that loved to move; laziness runs in my blood. But now I feel like I am a totally different person and I would never imagine myself without the routine and the new lifestyle that Ross made possible for me to adapt to. Training with Ross challenged me and made me achieve progress that I never thought possible. His sessions are different every time, challenging, and enjoyable, and I would recommend him to anyone that is looking to achieve a certain fitness goal, new lifestyle, or shed a few extra kilos. I’d had a personal trainer before and to be honest I’ve never been very good with my weight, letting it fluctuate up and down. But this time I let myself go more than ever before, too many holidays and nights out throughout the summer. 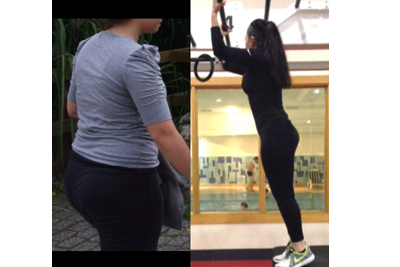 So this time I felt that I really needed to change for good and after speaking with Ross I remember being really impressed with the nutrition guidance that he promised to offer alongside the personal training, as the trainer I had before only given me vague advice. Also that he promised to leave me with no doubt of what I would need to do remain in good shape for the rest of my life impressed me also. I lost 13 ½ kilos (just over 2 stone) in in around three months which has left me absolutely delighted and with no doubt that Ross is one of the best personal trainers in London, as I know what it’s like to read all of the good things that other people say and have that feeling inside that you will be the exception. I wholeheartedly recommend Ross to anyone who is looking for a personal trainer in London and I’m sure that you can achieve all that you want with Ross just like me. Before working with Ross I had been attending the gym and doing cardio sessions (running and spinning). The problem was that all that effort wasn’t getting me the results I wanted. I had never thought of getting a personal trainer but after a chance meeting with Ross and 1-2 sessions training with him I quickly realized how great he was. Ross understood my goals and had built a specific training and eating plan around these. He created variety in all my work-outs, kept me focused and even when i was tired or lazy he kept pushing me to get the most out of each training session. What’s more he made sure I kept a holistic approach to my work-outs incorporating more weights and interval training as well as my cardio. Once i started training with Ross the weight dropped off and I managed to tone up and look the way i had wanted to for my wedding. Ross is an excellent trainer and has helped me not only meet but actually surpass my personal weight loss goal – loosing 1 stone in 3 months (this time included taking 2 weeks off at Christmas and 2 weeks off on holiday!!). I would thoroughly recommend using his services and think he is a tremendous help – he is friendly, provides personal attention and advice and keeps you motivated and on track to meet your goals. Train with him for a session and I am sure you won’t want to stop. 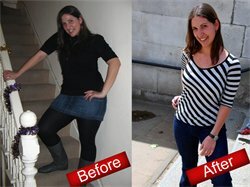 After a long time trying to lose the excess weight I had put on over the last couple of years on my own, failing miserably and wasting money on classes at the gym and self styled ‘miracle weight loss products’ I decided to try personal training. I did a quick search on google and came across Ross, basically I booked a consultation and never looked back. I have been training with Ross since November 2008. My training goals when we started were three-fold: to recover from a sciatic nerve problem affecting my lower back; to lose weight, and to increase my general ‘well-being and fitness’. Believe me; we started from a very low base in terms of my physical condition. 15 years working in the City with relatively little exercise had seen to that! The work I have done with Ross two or three times a week has had tremendous results: I now suffer no back pain; the ‘core strength’ and conditioning work that Ross has done with me has alleviated this. In addition to the training, I have been sticking to Ross’ principles on diet and exercise on my own too. This has involved changing what I eat and drink, running, rowing, cycling and swimming. I have lost over a stone in weight since November, but gained strength. Under Ross’ guidance, my general fitness and well being has improved beyond my expectations. We have now started doing ‘supersets’ on the weight training too. Training with Ross is never dull: in addition to being a great guy, he keeps the training fresh, and alters the routines. This means I can never predict what we will be doing before a session starts and the muscles get a fresh workout every time. I intend to carry on with Ross for the foreseeable future. He is my insurance policy against future back problems and my all-round good health. I look forward to working with him, and I know his business will go from strength to strength. Company Director – DixonGander Ltd. I find exercising at the gym boring and loose interest very easily, so I never really seem to stick to any routine or achieve the goals I want to. Finding something interesting and challenging to do can be difficult when you don’t have a lot of time and when you don’t know what you’re doing. Through personal training with Ross I have learnt how to maximise the short amount of time that I get to spend in the gym and my fitness level is the best it has been in years. When training with Ross, we always seem to do something new each session, so, on the days that I train by myself I can draw upon an entirely new range of techniques and exercises that keep routines exciting and challenging. 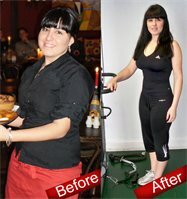 I have also learnt how to best compliment the personal training I do with the correct eating habits. I thought I was eating healthily as I was sticking to the Governments RDA’s but through specialised nutritional guidance from Ross, I realised that these recommendations are misleading and are often misinterpreted and I now have an eating plan to suit me. It’s always best to get expert knowledge when it comes to your health. With Ross’s expert knowledge of nutrition and creative approach to exercise it’s hard to not succeed in what you want to achieve. I had been going to the gym for about a year and in that time I had seen little change to my body size and weight. Ross Adkin has been my trainer for approximately 5 weeks and in that period there has been a noticible change in my weight and size, with having just 1 hourly session with him twice a week. He has also given me help with workouts that I can do on my own and also dietary advice.